Crackling with energy and a palpable zest for life, Steve Melen ’92 (BBA) seems to have time for everything and everyone: his day job as a financial advisor at Morgan Stanley, his 10-year-old daughter, Ava, the 15 racehorses he co-owns and races around the country, his many friends, and his volunteer work as a board member and the public face of the nonprofit Gastric Cancer Foundation. He’s also writing an inspirational book, and recently launched a new side business, selling the certified shoes of winning horses to people who literally want a piece of his luck. As it turned out, surviving two harrowing surgeries was just the first in a string of grueling challenges that Melen would face over the next few years. He went through chemo and radiation, losing 50 pounds in the process. The physical and emotional assault of fighting cancer and facing death left him addicted to painkillers and alcohol. His marriage ended and it took two stints in rehab and before he finally achieved sobriety four years ago. Those friends included a core group from his days at USD — guys who first met as college freshmen in 1988 and formed a superhuman bond during the following years. They shared rooms, houses and brotherhood in Sigma Chi. They surfed, traveled, studied, socialized and navigated young adulthood together. The group remained close after graduation, with some drifting across the country and several landing in and around San Francisco. They worked, married, started families and kept in close touch, despite long distances and the passage of years. For the most part, life was golden. No one could imagine that for Melen, it would change so drastically, so soon. Four years later, Melen is inhaling life with unbridled gusto. Like a kid doling out handfuls of candy, he shares his hopeful story and optimistic outlook with others fighting similar forms of cancer. It’s a big part of the work he does with the Gastric Cancer Foundation, which was founded by Gallagher with Melen’s personal and financial support. As a long-term survivor, Melen is part of a very small group; the fact that he is living so successfully makes his story even rarer. In addition to meeting patients and encouraging contributions, Melen has also starred in videos aimed at increasing awareness about the disease. Not long ago, he joined other cancer survivors on Capitol Hill, where they urged representatives and senators to support ongoing research funding. And he donated his own blood and cancer cells to a registry to help scientists isolate genes specific to gastric cancer. If pulling joy out of every moment sounds like Melen’s status quo, finding opportunities to spread it around is what fuels his drive to live. When he and his friends meet up, it’s often Melen who has arranged the trip. 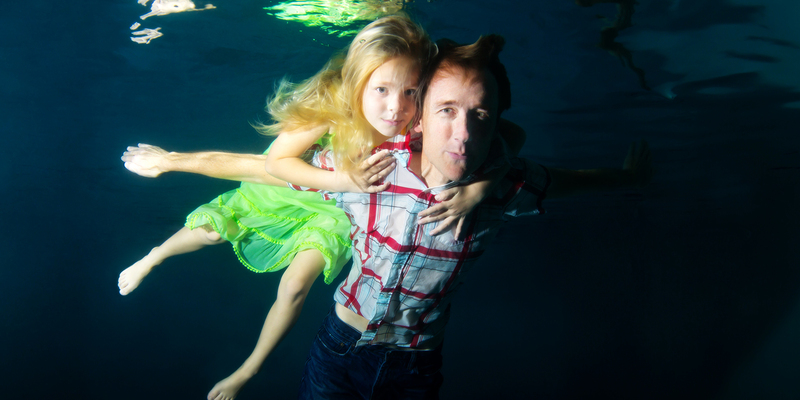 Photo: Steve Melen ‘92 (BBA) is pictured floating alongside his daughter, Ava. Hi Joseph. Yes, I still see Tim and Dave occasionally as they have been great friends since first meeting at USD. Thank you for your kind words and happy to hear you are doing well. Tough times to go through but the appreciation for life and family just increases. You are Special. You have a unique gift. I am extremely proud of you and happy for your happiness. You are a Winner!